We provide you with a few easy and novel dog birthday cake recipe ideas. 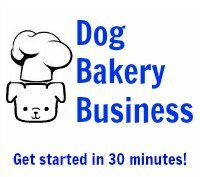 If you are planning to start a dog bakery business, making birthday cakes for dogs is a great way to start. Surveys taken of dog owners indicate that at least half will celebrate their dog's birthday in some way. This means plenty of opportunity for you to stay busy in your new business. Start by making birthday cakes for your friends' dogs. Word will spread and you will soon be approached to do more. The "Surprise" dog cakes are popular and fun choices especially for a birthday celebration. Why do the same old thing that everybody else is doing. Be novel and different, especially if you are planning to go into business. You want people to talk about your cake! When you see the photos of these finished cakes, you will see why they are fun and original. If you are not a professional,don't worry. The ingredients and directions are easy to follow and require no baking expertise. 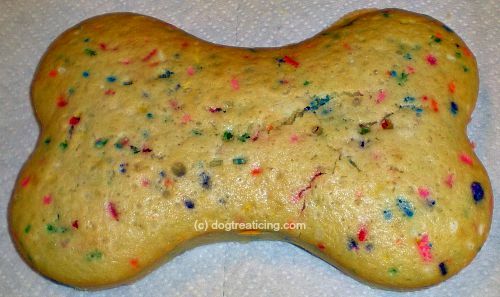 As the name indicates, this dog birthday cake recipe has a hidden surprise that is not obvious until the dog bites into it...especially if it's covered by a dog treat icing or frosting hiding the secret ingredients! Inside the dough little all natural colored cake sprinkles, also known as jimmies, melt during the baking process coloring the dough. The final result is a multi-colored cake! Grease the bottom and sides of the silicone cake pan. Stir dog cake mix, water, oil, and egg, until well blended. Fold in the sprinkles to the mix. Pour the mix into the bone shaped pan. Bake for 28-30 minutes, or until a toothpick inserted into the middle comes out clean. Let the cake cool approximately 10-15 minutes before removing it from the pan. Let dog cake cool completely before frosting. Frost with dairy-free Magifrost dog cake frosting. Add sprinkles on top while the frosting is still wet to complete the presentation. Then, let the frosting dry completely. It will dry hard and will not need to be refrigerated. Grease bottom and sides of the silicone cake pan. Pour into the silicone pan and cook for 4 minutes. Low-wattage microwave ovens may take additional time. Cake is done when toothpick inserted into the center comes out clean. Cool completely before removing from the pan. We give you some original birthday cake decorating ideas for dogs. Not only can you make dog themed shapes using these pans, but they are easy to clean and will not lose their shape. Just stick them in the dishwasher! Use them in the oven, microwave or freezer. They are so versatile. Metal pans can only be used in the oven, and you have to be very careful when you wash them or take the cake out so that you do not scratch the metal. Click for a large assortment of silicone baking pans to choose from. Use Magifrost dog cake frosting by Fido's Frosting. 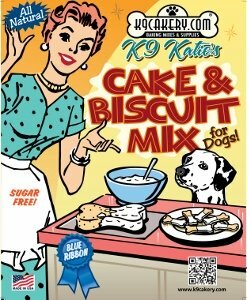 This is the dog cake frosting of choice used by the top dog bakeries. It is dairy-free so that pets with lactose-intolerance will not have stomach upset. Professional pet bakeries enjoy its ease and utility. The frosting will not melt in the heat. This allows them to ship their dog cakes all over the world! You can pipe decorations and color the frosting any color you choose. Use all natural sprinkles to add color. Some bakers like to use colored coconut. Simply soak shredded coconut in colored water. Others color sesame seeds to use as an alternative to cake sprinkles.